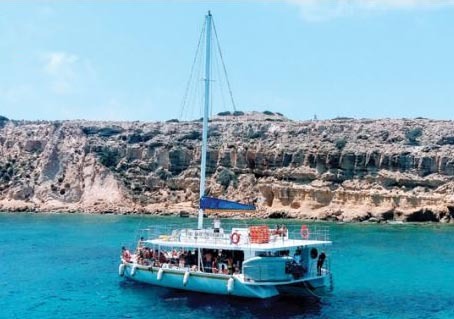 This very stable catamaran can carry a maximum of 80 passengers and contains plenty of seating space, spacious decks for sunbathing and dancing, two marine toilets, surround music and a pleasant shaded fully stocked bar. A swimming ladder makes it easy for guests to step into the water for swimming, snorkeling and canoeing. The experienced and friendly crew is always on hand to make the trip a safe sailing experience.